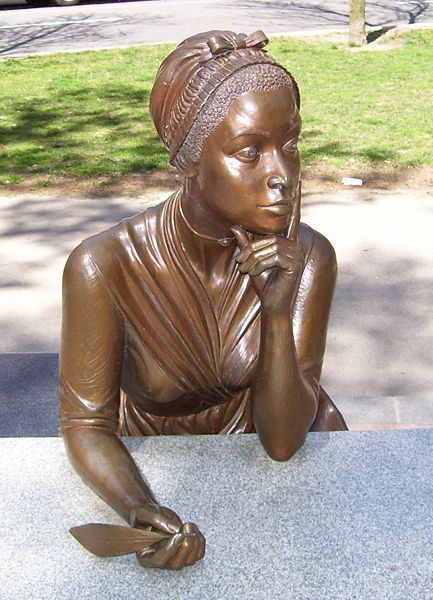 Phillis Wheatley was born in The Gambia or Senegal on the west coast of Africa about 1753. In 1761, when she was around 8 years old, Wheatley was kidnapped and taken to Boston. Once in Boston, she was purchased by a wealthy merchant, John Wheatley, and his family. They called her Phillis after the name of the slave ship she arrived on, and, as was the custom at that time, gave her the family’s last name. Although she was a slave, the Wheatleys both instructed and encouraged her education. Phillis Wheatley was tutored by the Wheatley’s son Nathaniel in English, Latin, history, geography, religion, and the Bible. The Wheatleys recognized her literary talent and encouraged it. Because many white people of the time found it hard to believe a black woman could be so intelligent and write poetry, Wheatley had to defend her literary ability in court in 1772. She was examined by a group of Boston luminaries including John Erving, Reverend Charles Chauncey, John Hancock, Thomas Hutchinson, the governor of Massachusetts, and his Lieutenant Governor, Andrew Oliver. They concluded that she had written the poems ascribed to her and signed an attestation to that fact. It later appeared in the preface to her book, Poems on Various Subjects, Religious and Moral, published in Aldgate, London in 1773. The book was published in London because publishers in Boston had refused to publish the text. Wheatley and her master's son, Nathanial Wheatley, went to London, where Selina Hastings, Countess of Huntingdon, and the Earl of Dartmouth helped with the publication. Her popularity as a poet both in the United States and England ultimately brought her freedom from slavery on October 18, 1773. After sending the poem, “To His Excellency, George Washington” She was invited to meet t General Washington in March 1776 for her poetry. Wheatley was a strong supporter of independence for the colonies throughout the Revolutionary War. After the death of the Wheatley family, she married a free black grocer named John Peters. This marriage produced three children, two of whom died very young. Wheatley’s husband left her and she earned a living as a servant. By 1784 she was living in a boarding house and, in December of that year, she and her remaining child died and were buried in an unmarked grave. She died in poverty at the age of 31. Wheatley's third child died only a few hours after her death. At the time of her death, there was a second volume of poetry, but neither it nor any of her other works have ever been seen. Wheatley's book is credited for helping create the genre of African American literature.